While chocolate is a Belgian speciality, express chocolate cake has become our speciality at the office (at home too! ); it is delicious and only takes 10 minutes…in the microwave! – In a microwave-safe dish, melt 125 g of chocolate pieces on high for 1 minute (we recommend Côte d’or melting chocolate). – Add 125 g of butter cut into small pieces and heat in the microwave for another minute. – Mix well and add 125 g sugar, 50 g flour and 3 eggs. – Mix well – heat for 3 minutes – let cool for 1 minute – heat for another 3 minutes. – Let cool… Serve and enjoy the applause. Recommended ages ago by one of our readers (don’t hesitate to send us your good deals!) and recommended by the entire International Food Truck Festival, we are finally recommending it ourselves in honour of the nice weather ahead and your love for coffee in all seasons. Here is the ideal food truck for a quick mid-afternoon date with George Clooney, or to simply cause a sensation and add uniqueness and a touch of gourmet to your events, by having still-warm cookies and steaming coffee delivered right to your door! The ideal alternative when you want to eat out without leaving home! Enter your address on the site and you can see a list of restaurants that deliver to your home by bicycle, as well as menus, the most popular menu items, and the estimated delivery time. All that’s left for you to do after making your selection is to pay with your credit card and wait for your timely delivery – warm fries and a smile from your bicycle delivery person are included! It’s a concert venue, but not just any concert venue! The writer penning these words finally went to the ‘AB’: a legendary venue, hands down the favourite among the writer’s inner circle because it’s beautiful, everything is perfectly organised (concert times are even based on train times, with a reduced train ticket price), the sound is really good, and (this is my own contribution to the list), the multiple levels help those who are under 5’3” enjoy the concert without missing out on a thing (in fact, from up top, we have the best view, we are the kings of the music world and it feels like everyone is clamouring for us). This experience was repeated twice in the same month and since then, we have been on the lookout for future concerts and events, as the venue hosts much more than concerts: www.abconcerts.be. Venture back to childhood or to the Stone Age! With or without the children, you will go back in time when you explore the Ramioul Cave and go bison hunting, find your way around a forest maze, or pull grass out with your toes: we had a fantastic time! APARTMENT : CASTLE LIFE ! Three ‘small’ new opportunities have opened up, three opportunities to live the good life at the Chateau de Bernalmont, with its golf course, affordability, and stunning view! 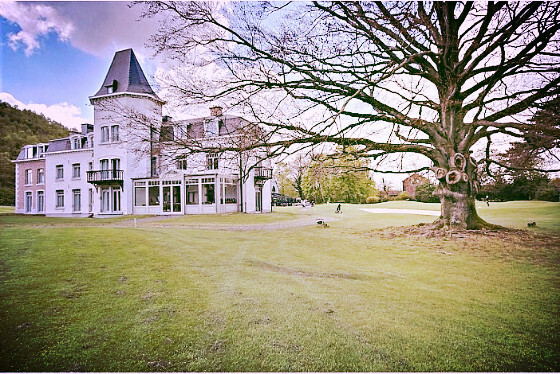 Located in the middle of a golf course next to the Brasserie de Bernalmont, this little piece of paradise in Liège has three magnificent and comfortable apartments available: the “Chateau Bernalmont 2“, the “Chateau Bernalmont 3”, and the “Chateau Bernalmont 2 PS“. We like them because they add a beautiful touch to our homes, offices, neck, ears, and fingers! Futuristic artists, a little on the eccentric side, the couple got into slow design by acquiring antique furniture, antique tableware, and wood scraps to create marvellous objects. We can see them, project by project, week after week, year after year turn their craziest ideas into reality with the help of innovative machines or techniques, and present us with unusual decorations, furniture, and jewellery. They’re in the news now because they have just opened a new boutique in Brussels, in addition to their many retail spots, even though it’s in Liège that one can most often run into them (especially during the pre-dinner drink hour on En Neuvice, surrounded by other shopkeepers and residents of the street).